If you’ve never been to Costa Rica, you’re in for a treat. Between the exciting volcanos, the lush rainforest, and untouched beaches, you’ll find yourself in awe throughout your adventure. Plus, Costa offers visitors a number of rivers that are ideal for rafting and kayaking, including the pristine Pacuare River. Here at Green Frog Adventures, we’re ecstatic to offer exclusive, customizable group and family vacation packages that include river rafting journeys over the Pacuare River. This river is ideal for individuals with all sorts of experience, since it offers up a selection of rapids ranging from class II (novice-level) to class V (expert-level) difficulty. Beyond the diversity of rapids, you’ll also find a diversity of wildlife that you can view from your vessel atop this glorious river. The Pacuare river starts in the inland portion of Costa Rica, near Turrialba (the closest major city), and it extends to the east where it meets the Caribbean sea. The river itself is about 70 miles in length, which have been divided into three main sections, based on the types of rapids that you’ll find in those sections. In the uppermost section of the river, the river is ideal for both kayaking and rafting, and those who ride this section will experience class II, class III, and class IV rapids if they complete the full 16-mile jaunt. If you’re a beginner, we may guide you through sections of this portion of the river. The second section of this river offers whitewater for more advanced kayakers. This section has narrower features, as well as more complex, more advanced rapids ranging up to class V in sections. This section is relatively short, featuring about 10 miles of narrower waters and more difficult rapids. We’ll only take experienced kayakers on this section. The final section of the river provides a variety of moderately difficult rapids, ranging from class III to class IV. Since this section is 23 miles long, we often take multiple days to navigate down the river. Along the entirety of the river, you’ll be surrounded by pristine rainforests, vibrant flora, and a plethora of animal species. Along your journey, you can expect to see a variety of animals. You can see river otters, anteaters, and a variety of monkeys throughout the trip. On rare occasions, sloths have been spotted, and if you’re especially lucky, you may even see a panther or jaguar — if you’re worried about big cats, don’t fret — you’ll be safe with our guides! In addition, you may see a variety of insects, birds, reptiles, and amphibians. The Pacuare River is home to a variety of tropical insects, including the blue morpho butterfly — a local favorite. You’ll also see colorful birds, as well as glorious birds of prey throughout the journey. Keep an eye out for toucans, parrots, king fishers, hawks, vultures, herons, egrets, and a number of other colorful bird species. You’ll also see a variety of amphibians and reptiles along the river, and you can even add a trip to the serpentarium to your trip to view colorful frog and snake species! With Green Frog Adventures, you’ll be able to stay at a number of locations as you make your journey down the Pacuare river. We invite guests to stay with us in Turrialba at Casa Turire, a beautiful property with a private lake and excellent, comfortable accommodations. From there, you might find yourself at the Pacuare River Lodge, a world-famous destination for kayakers and rafters who have made the trek to this renowned river. We can also include a night under the stars in your journey, where you’ll rest and recuperate (and enjoy a wonderful meal!) from the warm banks of the Pacuare. Here at Green Frog Adventures, we provide a number of vacation options to groups and families that are seeking to enjoy the splendors of Costa Rica. 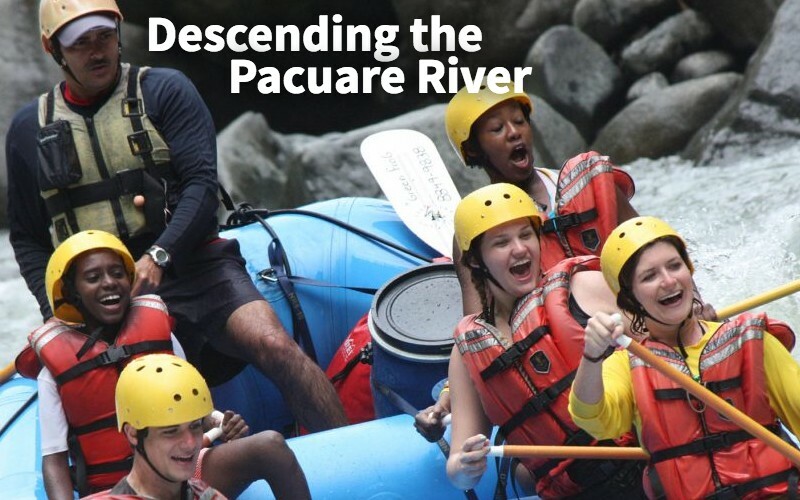 We offer a variety of vacation packages, including our Pacuare river rafting vacation package. Plus, as we mentioned, you can completely customize your trip to meet your every desire. If you’re ready to discover the richness of Costa Rica, we’d be ecstatic to help you make your journey, and to guide you along the way. Reach out to us to learn more or to get started!